In our times, people have too much of a habit of judging a composer according to whether he discovers something "new". New effects are felt to be a sensation, yet they are meaningless unless they are based on some inner necessity. In this sense, one cannot include Hummel amongst the avant-gardists. But at the same time, the opposite would be wrong, to want to give him a place with the traditionalists. Hummel is a master of all essential modern techniques of composition and applies these relevantly in his work. For this reason, his works are particularly suitable as way of experiencing modern music spontaneously. Hummel wrote his Dialogues for the violinist Boris Goldstein. Goldstein had requested that the second movement be in the spirit of Bach. The composer therefore took over a model from Bach, but without denying his own musical language. This movement thus became an impressive example of how old forms can be filled with a new spirit. The Finale is the embodiment of breath-taking virtuosity. Here, Hummel uses new playing techniques, such as e.g. clusters, so logically and consistently that they effortlessly become part of the stylistic texture. 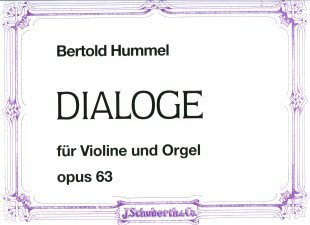 The first movement lives fron the alternation between violin and organ and is no doubt the main reason behind the name of the piece (Dialogues). Here one heard genuine literature, no awkward partial solutions which happen to have been written for this instrument, nor a piece of work that could equally well be performed on any other instruments. Hummel composed this work "going to the heart" of the violin. Form, compactness and the clarity of the ideas, full of fantasy and lofty thought, develop a power of expression and a richness of musical invention which guarantee the young work a firm place in the somewhat scanty repertoire for these instruments.